To describe our Ride of Silence last night is hard to encapsulate in a few words. In a way, you wish these rides weren’t necessary. Until that point, I have to say that I’m very proud of our event last night. I had no idea what the attendance would be because sometimes online RSVPs don’t always reflect people’s commitment. It wasn’t until I started getting calls from the press unsolicited that I knew this was going to be big. In fact, I stopped promoting it because I was more focused on having a well organized ride rather than volume. 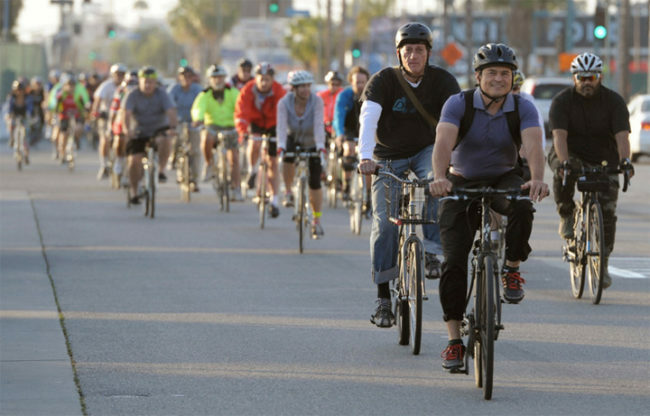 Still, over 100 cyclists showed up as well as the Daily News(photo gallery) and TV crews from KTLA & Fox11. What I was proud of was that we had a large cross section of the community from every demographic. More photos will be posted onto the LACBC website today, but I want to thank all the people, ride marshals, Louise Olin, Andrew Said and other LACBC staffers for making this event so special. Cyclist Killed in Panorama on Deadly Woodman Ave.